Animal breeders are responsible for producing animals that may be used for a variety of purposes including companionship, show, sport, or consumption. Animal breeders use their knowledge of genetics and conformation to select breeding stock that will produce superior offspring. Successful animal breeders try to promote valuable traits (for example high milk production in dairy cows) when planning their breedings. The usual duties for animal breeders include facilitating breedings by live cover or artificial insemination, assisting with difficult births, maintaining cages or enclosures, feeding, administering supplements or medications, treating minor injuries, and keeping detailed health and pedigree records. Animal breeders often work in conjunction with large animal, equine, or small animal veterinarians to maintain proper health of the breeding stock and their offspring. Breeders may also show their stock in a variety of judged breed shows and competitive events. Both companion animals and livestock breeds may gain additional value as breeding stock if they demonstrate their superiority on the show circuit. A dog that wins “best in show” at the famed Westminster show, for example, would command a very significant stud fee in the show dog breeding industry. Animal breeders can specialize by working with a particular species (either for commercial production or companion/competition purposes). Some of the most popular areas of specialization involve producing dogs, cats, horses, cattle, goats, sheep, rabbits, fish, exotic birds, reptiles, or poultry. Many breeders narrow their focus even further by becoming experts at producing one specific breed within their species of choice. Breeders may further specialize within their breed of choice by selecting in favor of performance for a particular purpose. For example, some Quarter Horse breeders select for a body type that promotes speed and racing ability, while others select for another body type so that their foals will be able to compete successfully in halter show classes. Animal breeders may be self-employed or work as an employee of a major commercial farm or producer. Both full time and part time positions are possible. While no formal degree is required for a career as an animal breeder, many in the industry have degrees in areas such as animal science, animal reproduction, or biology. Coursework for such degrees generally includes the study of subjects such as anatomy, physiology, reproduction, genetics, nutrition, and behavior. Courses in marketing, communication, and technology are also beneficial for aspiring breeders. Experience with the species and breed being produced tends to be of great importance. This necessary experience can be gained by judging or competing in breed shows, working for major producers, or completing a formal course of study at the college level. 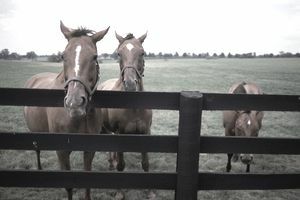 Depending on the species they work with, animal breeders may need to develop specialized skills with regard to utilizing artificial insemination or live cover breeding techniques. The annual earnings of an animal breeder can vary widely based on the type and quality of animal they are producing, its intended use, the current value of such animals, and the breeder’s reputation in the industry. The 2014 Bureau of Labor Statistics salary survey found that animal breeders earned a mean salary of $43,470 ($20.90 per hour). The highest mean salaries for animal breeders were found in New York ($52,180), Wisconsin ($42,210), California ($39,240), and Kentucky ($36,900). It is not coincidental that these states include some of the largest livestock production centers in the U.S. Some animal breeders choose to work only part-time while holding a full-time “day job” in another industry. These part-time breeders generally earn a significantly smaller income than full-time participants, though this is not always the case. Slow but steady job growth in the field of animal breeding is expected, with more significant signs of growth likely in the livestock industry. Specialty breeders of performance animals (such as show dogs or horses) should also see continued growth in their segments of the industry. Part-time breeders will also continue to make a contribution to the industry while holding full-time positions in other fields. The animal breeding industry is easily accessible as a part-time endeavor, especially when the breeder is interested in becoming involved with the production of companion animal breeds. Breeders are encouraged to use discretion when selecting animals for breeding purposes and to not allow inferior representatives of the species to contribute to the gene pool. Superior progeny will enhance an animal breeder’s reputation and ensure their continued success.